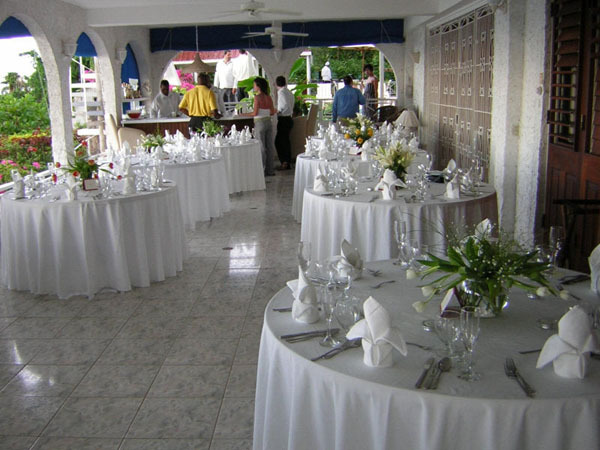 Golden Clouds Villa Estate has become “The” place for weddings in the Caribbean. 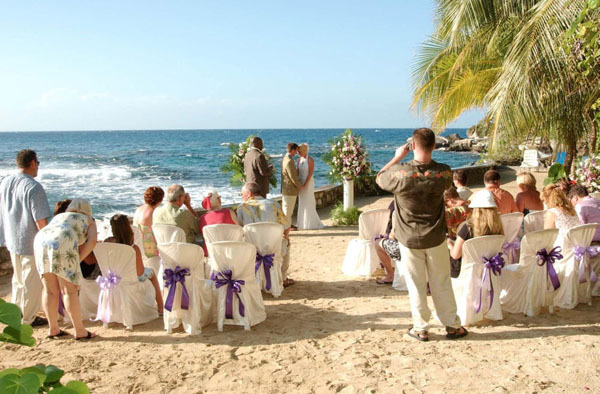 Every bride dreams of a truly romantic setting for her wedding day, and for a destination wedding, nowhere can compare with the tropical surroundings offered by Golden Clouds Estate Villa, in Jamaica. 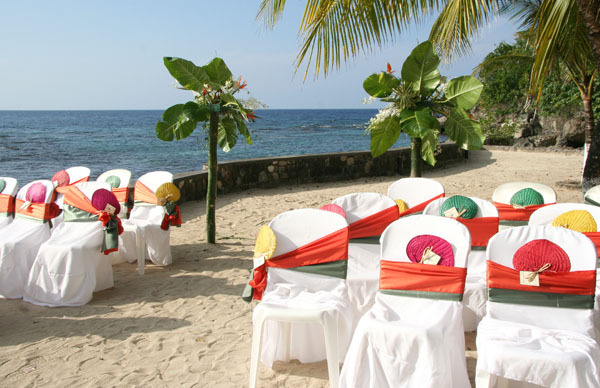 Swaying palm trees, exotic aromatic flowers, lush vegetation, tropical breezes, sparkling blue sea and a pristine sandy beach all combine to provide the ideal backdrop for the perfect Caribbean wedding. We can help you coordinate all the paperwork through any of our wedding coordinators or you can use your own. Specific rates apply. Please ensure that the original or certified copy of Birth Certificates and or Divorce/death Certificates are sent so they arrive at least 4-6 weeks prior to the wedding date. Documents submitted, original or certified, will be returned upon arrival in Jamaica. 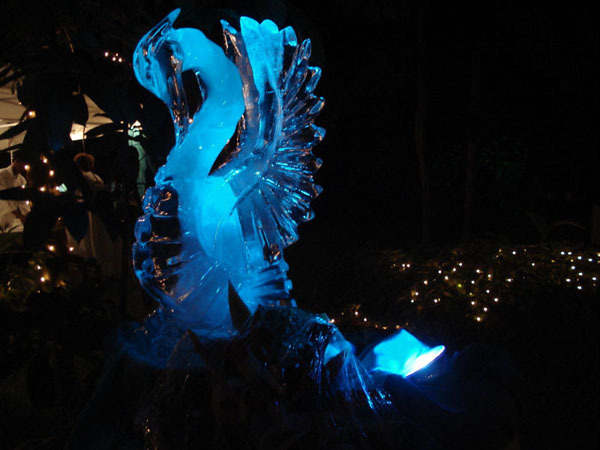 We have many talented wedding coordinators or feel free to use your own. Golden Clouds can accommodate up to 22 guests. If you have additional quests we can recommend that you put them up at the nearby Blow Hole Villa located almost next door. We also have over 20 villas in nearby Ocho Rios. 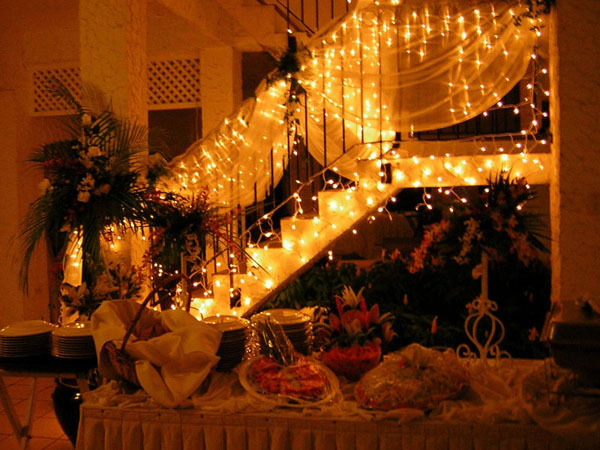 A Villa wedding helps considerably to keeping your wedding costs down. Whether you choose a sit down dinner in the dining room terrace or a poolside buffet, the bridal couple is paying for the actual groceries for a menu that they and the cook agree on. Blossom, your cook, will suggest various options from finger food to a Jamaican Roast Suckling Pig banquet. Having already paid the Villa rental (which of course, includes your cook), no banquet charge or caterer’s fee is added unless the size of various events require the hiring of additional staff, and catering supplies (china, silver, etc.) For groups over 18 people the reception must be catered. The Gazebo - Located on the Main lawn amidst fragrant flowering foliage and Jamaican songbirds as your choir, and Heaven as your ceiling. Chairs can be provided around the Gazebo for your guests. The Bride and Groom along with the Minister are under the Gazebo. After the Ceremony a table is set up on the lawn for the Champagne Toast. 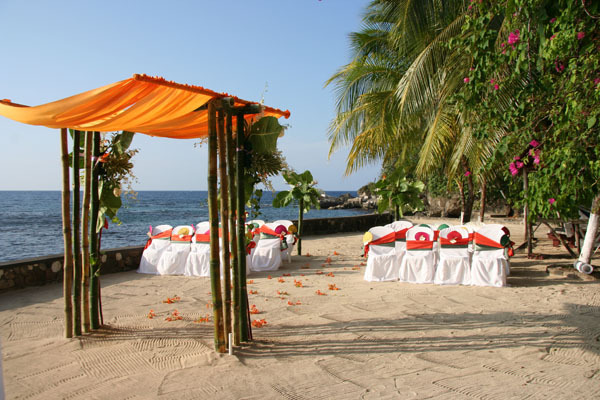 The Beach - Some of our past guests have had the Wedding Ceremony on the Beach. Some have done this in a formal way some casual. 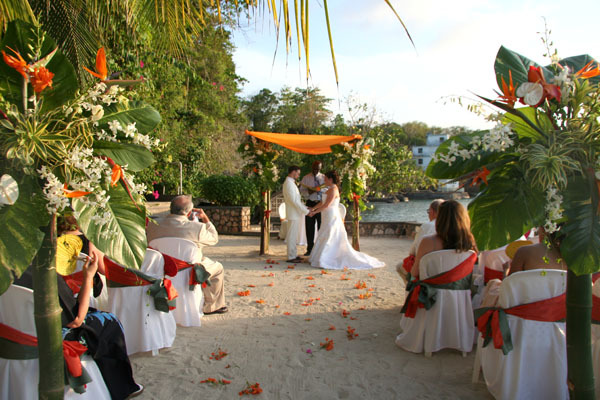 The idea of getting married on a beautiful white sand beach at sunset seems to be very popular. After the ceremony all he guests go back to the Villa where the Champagne Toast is set up in the West Wing Patio. 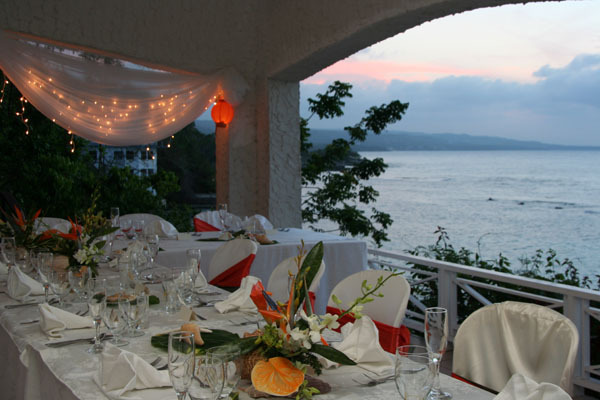 The Front Terrace - Overlooking the Caribbean Sea at Sunset has also been very popular. Also, after the ceremony the Champagne Toast takes place in the West Wing Patio. Blossom, the chef at Golden Clouds, is renowned for her absolutely fabulous “Coconut Wedding Cake”. She can make it with a rum flavor if you want. 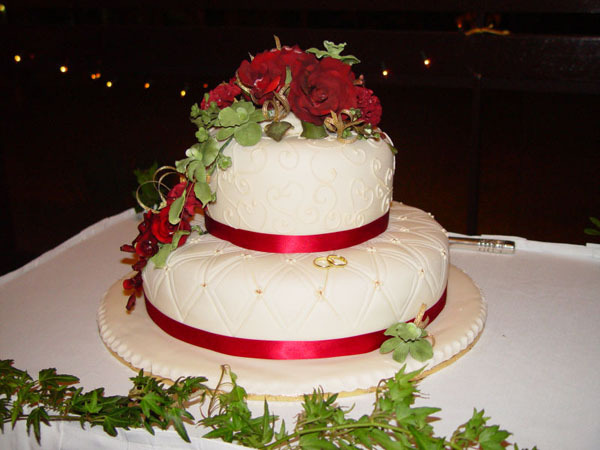 You can have the top of the cake decorated with fresh Jamaican flowers or bring your own cake top. Talk to Blossom on just what you want. You can have a traditional Jamaican Wedding Cake. This Wedding Cake is dark and rich like a Christmas pudding, made with dried fruits such as prunes, raisins, dates, currants, cherries, etc. These fruits are finely chopped and marinated in wine and rum for weeks. This wonderful blend forms the base of your cake mixture. A crisp white frosting and fresh flowers complete the picture. Your cake can have one, two or three tiers. (Leftovers will last. Traditionally small pieces of the cake would be mailed in little boxes to friends and relatives who could not attend the wedding, and the top tier of the cake would be packed away and kept for use as the first child’s christening cake). Cost of the Jamaican Wedding Cake will depend on how many guests you wish to serve. Talk to our wedding coordinator about ordering. Bar Set Up - Wines, Beers, Champagne, Sodas, etc., etc. Just tell Blossom what you want. The above are only suggestions. You can plan your own menus and go over them with Blossom. She’s a great organizer. The required gratuity to the staff at a villa where any wedding events are held is 20% of the villa rental in Low Season and 15% in High Season. This amount is to be paid locally to your staff on departure day. 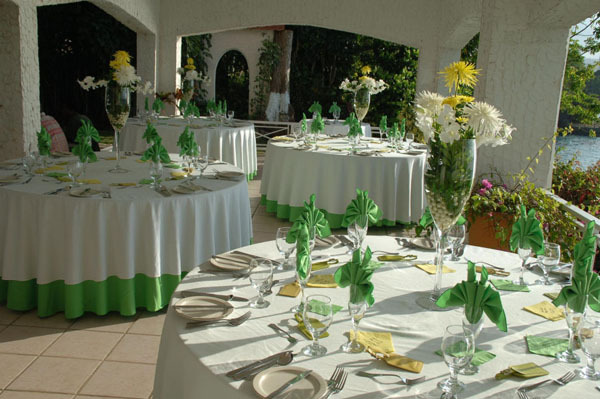 Golden Clouds is one of the few villas that has all inclusive wedding packages. A wedding a few years ago had 38 people. They had their family and close friends (16) stay at Golden Clouds and the other guests were at Golden Seas Hotel and Windjammer villa. Their guests arrived in Jamaica on a Saturday and were met at the Airport by one of our van drivers. The guests were driven to the hotel where the bride and groom met them and made sure they were all settled. That night, Saturday, the hotel had a b-b-q night with music and dancing so they all had dinner together at the hotel (while the staff was preparing for the next day Wedding). The bride and groom along with their family returned to the Villa late that evening to finalize plans for the late morning Wedding Ceremony. The ceremony took place at the Gazebo, in the main lawn, with chairs set up around the gazebo and the table in the lawn set up for the Champagne Toast. After the toast, they all walked down to Golden Clouds (the main Villa) and enjoyed their Wedding Brunch. They had their Wedding Dinner Party that evening after sunset at 7:00 P.M. where a fabulous Steel Drum Band played and they enjoyed their Jamaican Style Wedding Buffet. 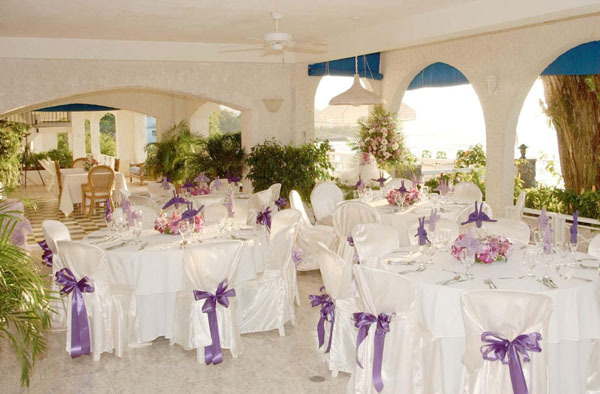 All the tables were set up in the West Wing sitting area decorated in pink and white, candles on all the tables as well as beautiful Jamaican flower arrangements. Beverages were served from the bar (champagne and wines). The band played till late that evening where everyone danced and danced. After the party was over the van came to pick up the guests and drive them back to their hotel and Windjammer villa. The Bride and Groom wanted to have their friends not staying at Golden Clouds to spend the next day and night at the villa for meals. Their van driver picked them up in the morning and the guests enjoyed playing tennis, snorkeling and just relaxing on the beach. A buffet lunch of assorted sandwiches and salads was served by the pool. 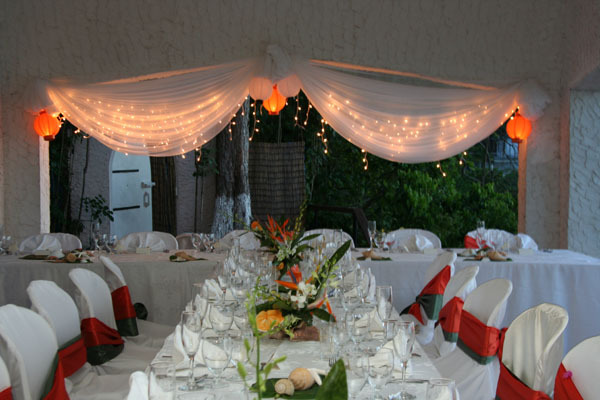 After the day in the sun the guests returned to the hotel and freshened up for dinner at the villa that night. The dinner that evening was a casual affair of B-B-Q of Jerk Chicken, B-B-Q Chicken, Hamburgers, Hot Dogs, Baked Beans, Green Salad, Fresh Fruits and desserts. Each group does it differently. Whatever you decide on can be accommodated.